I had planned to do this as a single post, but I’ve changed my mind as it would be too big. This first post will present the evidence and the second will show how I’ve made my jacks and will discuss some of the difficulties and some things I’ve found. From my point of view, jacks and bombards are the pinacle of leather vessels, there’s a purpose and elegance of form that isn’t so apparent in the other containers. Oliver Baker, a gentleman collector writing in the late 19th century, appears to have interviewed craftsmen who, if they didn’t make leather jacks, saw them being made in their youth. He wrote a detailed account of the production, pulling it from publication as he was worried that he would enable the collectors’ market to be flooded with good copies rather than the poor work he railed about (many his signs of a counterfeit jack feature on the rubbish peddled at medieval faires and more worryingly, by English Heritage at their stores). Many people therefore claim that there’s nothing about manufacture in Baker’s work, but if you look in the earlier chapters and the section he did print on making jacks, you can pick up almost the complete story. It all revolves around this picture on p188. [p76] …there are incised lines on the spout portion arranged in a pattern not unusual in jacks of the 17th century. [p122] This smaller one is of unusual shape, as, instead of the ordinary circular base, it is longer from front to back than from side to side, measuring 9 inches by 8. This is very unusual, as jacks are almost invariably circular in plan, the base being round and the top shaped for pouring from, according to the fashion of the period or the taste and fancy of the maker. [p132] There can be no doubt that the ornate handles of these smaller jacks must have been stitched when their shape was only roughly developed, and that they were cut into shape afterwards. The lines of stitching are outlined with incisions previously made in the leather as a guide; and after being stitched the ornamental contours were cut out with a sharp knife as tracery is cut with a fretsaw, as close to the threads as was consistent with safety. If the complex handles he’s talking about are made the same way as the simple handles, this last statement is inconsistent with figure 70 on page 188. 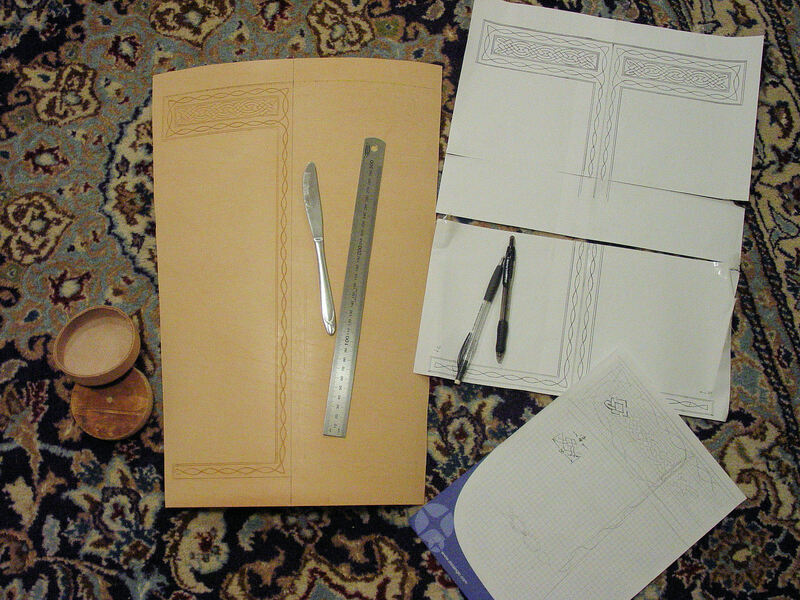 The figure shows the shape of the leather for a jack with the handle already cut. I take this a schematic diagram of how the jack would look, if it were laid out flat again after forming and stitching. I also reserve the right to be wrong on this point, but can’t see why there’d be different ways of cutting the handle depending on the complexity of the design when it results in a better finish even on the simple triangular handles. Cutting the handle before shaping would result in the handles being stretched excessively during the moulding stage. The Brother of St. Cross also remembered in Kings-gate Street, not more than two hundred yards from the College, the shoe-maker’s shop at a house which [p180] is still standing, where more than sixty years before he saw four leather jacks made. The particulars he gave me of the process have been of considerable interest in supplementing the knowledge obtained from a study of the vessels themselves, as to the manner in which they were made, and I had written for this chapter a long and detailed account of the method pursued. It seems, however, desirable not to print it, as the value of old jacks and bottles having increased, the temptation to make imitation ones has become greater within recent vears and I have decided to omit most of the details. [p182] THE MAKING OF A BLACK JACK. It is an interesting fact that at Messrs. Merryweather’s factory at Greenwich black jacks continued to be made down to the middle of the 19th century, and still more interesting that the great wooden blocks and rings on which they were modelled are still in existence. In one old corner of what is now a vast establishment for the making of fire-engines and kindred appliances, are a number of odd looking wooden objects much like big skittles upside down. (Fig. 72.) These cores or blocks appear to be of considerable age, and are certainly more than a century old. As can be seen by the sketch they are not like jacks in shape, because their necks are unduly prolonged and the portion which modelled the vessel’s spout is a separate piece of wood. This arrangement enabled the wooden core to be more easily withdrawn after the body of the jack had been worked in a damp condition into the required shape and dried on the block. The bottoms were moulded separately on iron rings (a number of which have been preserved with the blocks) and after drying were stitched into place. [p188] OF SPURIOUS JACKS AND BOTTLES. My apologies for quoting huge slabs of text but I wanted to make sure each remark was in context. To save an equal amount of text, I’ll paraphrase Baker’s comments about the shape of the handles being a useful guide to dating. Generally, up to the middle of the seventeenth century, handles are triangular in shape and start with a small step down from the top of the jack. Later jacks have a more curved handle further down the side. Any method of production must take all of these requirements into account. The base must be formed from a single piece of leather, worked over a round former in some fashion. The body must be made cut as a single piece of leather, and at some point in the process before stitching begins, the waste around the handle must be cut off and made into the reinforcing pieces. The body should be shaped around a wooden core with a removable piece for forming the spout. Stamping or carving should happen while still on the block and finally, the handle should not be finished until after the stitching is complete. Even with all this, Baker was comfortable he’d left enough information out to make it impossible to make good fakes. Given Baker’s omissions, I feel it is fair to add extra steps or equipment within the limits of the technology available at the time of the one you’re making. The second part in a week or two (or three) is about my attempt to fill in the missing detail. It is entirely conjecture, and draws heavily on the work done by Greg Stapleton of the Royal Ontario Museum. In the meantime, feel free to comment, point out logical errors or posit your own theories. Another Saxon quiver, this time 7th century. I was going to say something glib along the lines of “I won’t discuss construction as that has already been covered in an earlier post”. I’ve just checked that post, and in it, I left construction for a later post. I guess this will have to be it. While of a similar shape and height, this quiver is a little larger in diameter than the previous one. This is deliberate, as while primarily for my younger son, I also want to be able to use it and my bow has a 60# draw weight with correspondingly thicker arrows. The change of period is mainly done by the decoration and as it wasn’t for an order, I could devote more time and effort to the design and execution without someone keeping asking when it would be finished. Cut a disk of softwood about 80mm in diameter and 20mm thick. I used a piece of pinus radiata from the wreckage of the First Airborne Viking Tent of blessed memory. You could use ply if you like, but I like to think real wood looks and works better. 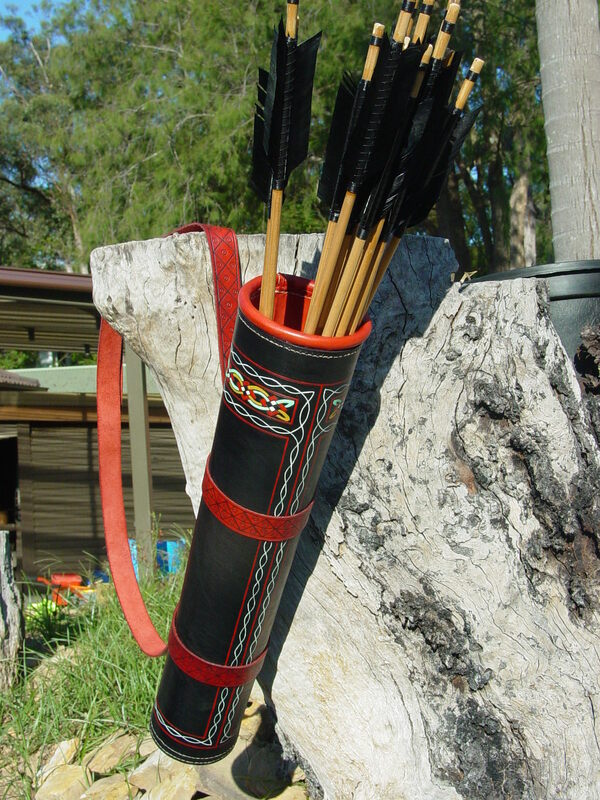 It will remain in the base of the quiver to protect the leather from the arrow points. Cut a rough circle in 3mm leather that’s somewhat over 120mm diameter – the diameter of the disk, plus twice the height, plus a bit for not quite being aligned properly. Wet the leather and place the disk on the flesh side in the centre, then press into a 90mm storm water pipe connector and leave to dry. When the base is dry, pop it out of the connector and trim so the edge of the leather is flush with the upper edge of the wooden disk. This is the same way as I make bases for jacks and bombards – more in a later post. Rather than using a round of willow, this one has a piece of 1.6mm leather rolled until it is a bit over 12mm thick. Bring the rolled ends together to form a ring and secure with stitches. I used edge-grain stitching so all the shows is two neat parallel lines, one either side of the join. Dampen it and work any lumps or puckers out with you fingers until the roll is even. When in place, the tail will extend some distance into the quiver to help keep the round shape at the top. Mine was 370mm wide when it was flat, to fit an 110mm wide opening at the top of the quiver. This is where the fun starts. The width at the bottom is the circumference of the base cup you’ve made, plus three times the thickness of the leather. This is because the base is the measurement on the flesh side of the leather and you’re cutting for the skin side. You’re increasing the diameter of the base by the thickness of the body on two sides, so if using a non-stretchable material, you’d need to increase the length by 2*pi * the thickness, but the leather stretches sufficiently to meet neatly. Width at the top is the diameter of the tail of the top ring, plus a similar fudge factor. The height is just a bit less than length of your arrow from the back of the head to the base of the feathers. Do any embossing and dyeing now, then start sewing. Remove the wooden insert and sew the base in using saddle stitch. I’ve done two rows because it helps keep the edges clamped in place. Put the wooden base back in, then start sewing the back seam. I’ve used a backing strip of 1mm leather and two rows of saddle stitch, but edge-grain would work equally well. You’ll need to do a bit at at time so you can get your hands in behind the seam. Then sew the top piece in and do the straps. Now you’ll have to do some proper hand bound arrows to match. 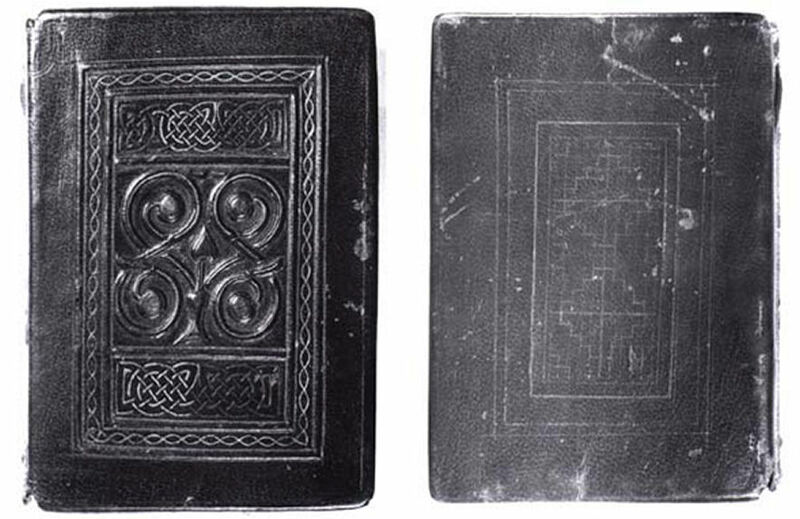 Front and back of the Stonyhurst Gospel, c AD650. The design, techniques and dye colours are based on the binding of the Stonyhurst Gospel. There’s still some pigment in the embossed lines. 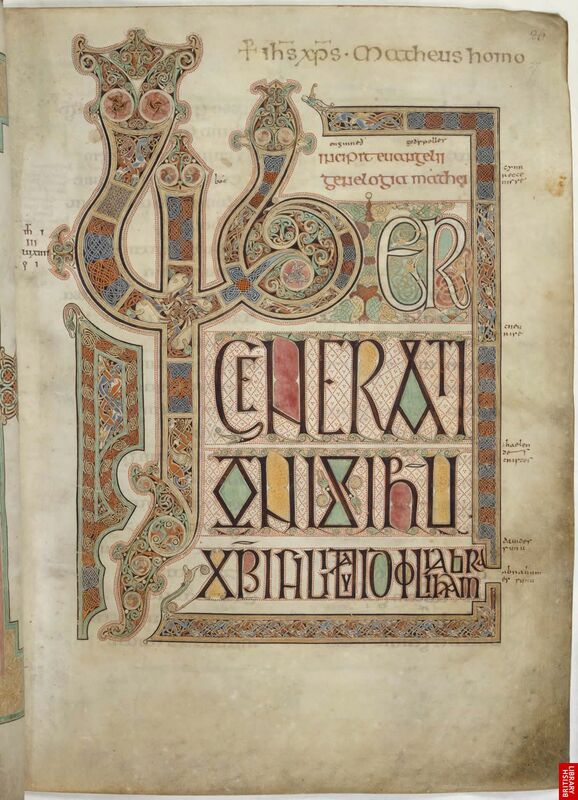 The Lindisfarne Gospels: Gospel of St Matthew the Evangelist, initial page. Lindisfarne, late 7th or early 8th century. The paint colours and the some of the other design elements come from the more-or less contemporary Lindisfarne Gospel. I drew a quarter of the design on graph paper, then scanned it and used Paint software to mirror and fill in the missing bits. This was printed, transferred to the leather with yellow transfer paper and embossed with the back of a butter knife. Once dyed and assembled, I painted the design. As this was for a teenager, I cheated and used acrylic paints for the flats and gel ink pens for the embossed lines. The straps were finished with a suitable buckle and strap end.